We hope you’re not done with award season just yet. Hootsuite (that’s us) has some very prestigious (or ridiculous) awards to hand out for Instagram excellence. Without further ado, here’s a list of some of our favorite Instagram content from the past year and what you can learn from the brand behind the account. Disclaimer: I am very pro dairy. Cheese, yogurt, ice cream—I’ll take it all. But the winner in this category makes dairy-free milk and cream products, and I’m not even mad about it. Why? Because Califia Farms has mastered the art of showcasing their products in creative ways. Instead of just posting videos of nut milk being poured in a glass over and over again, they demonstrate how to repurpose their bottles, how to heat up their cold brew (go figure), and step-by-step recipes. Yes, you can heat up our cold brew + make it *warm* brew. Key takeaway: Video is a wildly engaging content format on any platform—but it doesn’t make up for boring content. If you’re going to use videos on Instagram, put some effort into it. Check out our 10-step guide to creating great social videos for guidance. Kylie Jenner may have almost broken Instagram recently with a post announcing her baby’s name (17 million likes and counting) but when it comes to pregnancy announcements, no one touches Beyonce. This post became iconic instantly, inspiring copycat announcements and Halloween costumes around the world. Call me hyperbolic, but it’s basically our generation’s Mona Lisa. Key takeaway: All hail Queen Bey. Reynolds Consumer Products is an American household goods company that produces kitchen essentials like Reynolds Wrap foil and Hefty garbage bags. On first glance, you might think their Instagram account is simply a nice collection of delicious food photos shot from above with perfect flat lay technique. But look closer, and you’ll notice that each shot creeps into the one beside it. When looking at their profile in gridview, it looks like one long continuous table that I desperately want an invitation to dine at. Key takeaway: Focusing on the details of your individual posts is obviously important, but don’t forget about the whole. There are plenty of ways to get creative with the overall look of your Instagram grid. 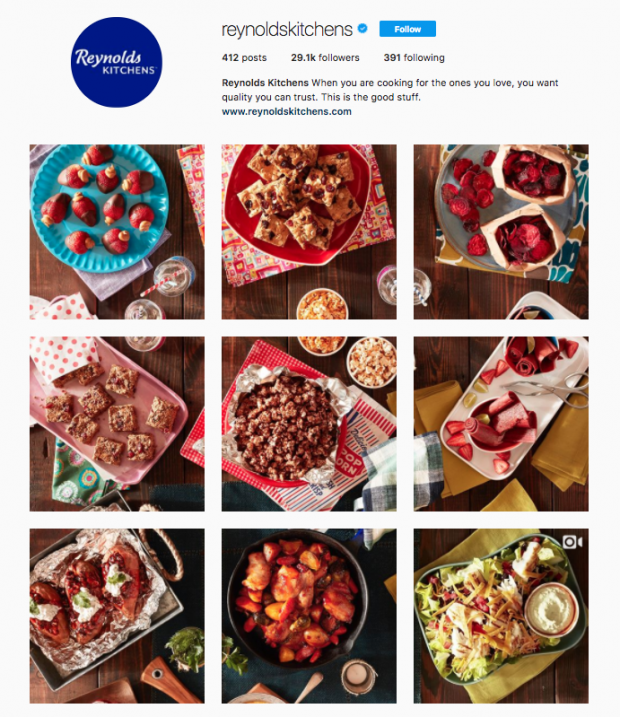 You can make it appear to be one continuous shot like Reynolds Kitchens, or focus on three pictures at a time so that each row of your grid has a common look or theme. I’ll be honest, I was forced by my co-workers to include this post, but I don’t know why. They obviously don’t know what “product placement” means, because all I see here is a beautiful, inspiring picture of a dog relishing his accomplishment in the great outdoors with his favorite drink. Makes perfect sense. I’ll take three cases, please. Key takeaway: I am very susceptible to subliminal advertising. Take it from me, you don’t need to be high to enjoy the videos on this Instagram account—but you might end up feeling that way after watching them. For example: a wave in slow motion! Skating on crystal clear ice! A soap bubble freezing in real time! Whatever this is! Not only does this account command my full attention every time I see it appear on my feed, I’m often so hypnotized I watch the same video two or three times in a row. Key takeaway: Be interesting. You’re competing with some incredibly eye-catching content on Instagram. Make sure everything you post is worth admiring, watching, and liking. Who knew the Venn diagram of people who like Drake and people who like cake would overlap so much? Joy Wilson (who has her own equally impressive Instagram account), has struck gold putting the emotionally rich poetry of this hip hop mogul onto beautiful, intricate cakes. My only question is: what happens to these cakes after the photoshoot? Asking for a friend. Key takeaway: If you want to create content that’s sure to be a hit on Instagram, find creative ways of using what’s already popular on the platform. Gorgeous photos of food have always worked, but this unexpected twist makes them that much more appealing. The makers of this iconic permanent marker understand there’s no better way to cultivate a strong community on Instagram than by reposting user-generated content (UGC). They regularly share beautiful photos and videos created by artists around the world using Sharpie products, which is a win for everyone involved. The creators get their work exposed to Sharpie’s 200k+ followers, and Sharpie gets to show the incredible potential of their products. We believe in writing permanent love notes. Key takeaway: It ain’t all about you. Instagram revolves around sharing content, finding new audiences, sparking conversations, and building a true community. So take cues from your audience, and make them the star of the show. You may think winning the Westminster Dog Show is the pinnacle of dog achievement, but we would disagree. 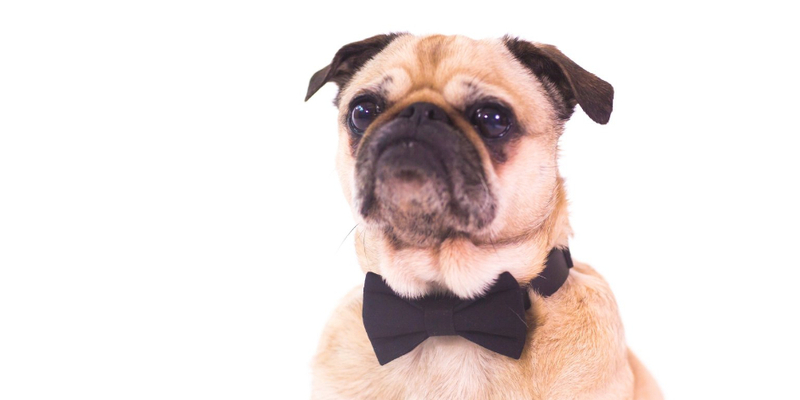 Being featured on WeRateDogs is undoubtedly the most distinguished accolade for a pupper in this day and age. Not only does each post come with a beautifully crafted caption highlighting each dog’s unique talents and personalities, they haven’t managed to find a dog yet worthy of anything less than a 12 out of 10. That’s quality, people. Key takeaway: We don’t deserve dogs. Not every brand has interesting behind-the-scenes content to share, but the United States Transportation Security Administration (TSA) sure does: ridiculous items that people try to take on airplanes. Exhibit A: this paint roller wrapped in sandpaper and wire, with nails sticking out of it. This looks like something out of a Mad Max movie. It’s as if Mad Max wanted to paint the Thunderdome with the blood of his enemies. It’s a paint roller wrapped in sandpaper and wire with nails protruding. This was discovered earlier in 2017 in a carry-on bag at Chicago O’Hare (ORD), but I just acquired a picture of it today. Along with these absurdities, the TSA also answers questions (fun fact: you can bring a cheese grater on an airplane) and shares other snapshots of their day-to-day experiences—like adorable and talented bomb-sniffing dogs. Key takeaway: Use social to add some personality to an otherwise no-nonsense brand. The TSA is an agency of the U.S. Department of Homeland Security—not the most quirky brand on the surface. But they use Instagram to show another side of the organization, one that is personable, witty, and entertaining. Zooey Miyoshi is better dressed, cooler, and more popular than I’ll ever be in my life and she wasn’t even alive when Instagram was invented. Key takeaway: Micro-influencers are the future of influencer marketing (and they don’t necessarily have to be toddlers). Thursday is arguably the best day on Instagram, particularly if you’re a fiend for nostalgia. Throwback Thursday (#TBT) unearths awkward family photos, forgotten moments, questionable trends of decades past, and a glimpse into history. Although there are many amazing examples of brands using #TBT to tell stories about their company history, I still think about this #TBT post from actress Taraji P. Henson on a regular basis and therefore believe she truly deserves this honorable designation. #TBT #SeniorPix You couldn't tell her ISH!!! She knew she belonged in #Hollywood right here, she just didn't know how she was getting there but she DREAMED BIG AF!!! #DidntknowIn91betchaknowmeNOW *Diddy voice* ???????????????? Key takeaway: We can’t all be as fierce and determined as young Taraji, but we can use #TBT as a way to pre-plan Instagram content for the week and make our lives a bit easier. There are plenty of other Instagram hashtags you can use to attract new followers, gain more likes, and increase engagement. Check out our complete guide to Instagram hashtags here. Instagram may be all about the photos and videos, but words matter too. A caption that makes your followers think, feel, or learn something is more likely to inspire engagement than one you barely put any thought into. NASA nails this. Space is pretty beautiful on its own, but the captions they include give valuable and awe-inspiring context to each photo. Key takeaway: Create captions that add context, show off your brand’s personality, entertain your audience, or prompt them to take action. Here are 11 tips for creating better Instagram captions. Key takeaway: We’re only one Photoshop session away from living our best lives. It’s a collection of hot dads at Disneyland. Need we say more? Key takeaway: I’m never taking my husband to Disneyland. I didn’t know that my ideal form of therapy was watching people poke, prod, and pull homemade slime on Instagram—but here we are. The trend began in Thailand, and quickly spread (slimed?) across to North America. This account, run by a 22-year-old from Vancouver, is particularly satisfying. Key takeaway: Autonomous sensory meridian response (ASMR) is the internet gift that keeps on giving. In their Instagram profile, Airbnb promises to “open the door to interesting homes and experiences, even if it’s just for a night.” And that’s exactly what they do, post after post. Not only is every photo gorgeous to look at, they each tell a story—from remote jungle villas to surreal glacier views, hearing stories of old East London or kayaking past volcanos. It’s a simple brand promise, but one they consistently live up to. Key takeaway: Does your Instagram account have a purpose? It should. And that purpose needs to be more than just: “Promote our business on Instagram.” What will people get from following you? Will they learn something new? See things from a different perspective? Laugh or cry? Define your purpose and craft content that supports it.